Share your exciting Ozone and AOP technological advancements and experiences in this unique forum - showcasing the world's premier advanced treatment technologies! Will receive a $100 discount off of the early bird Conference registration fee! 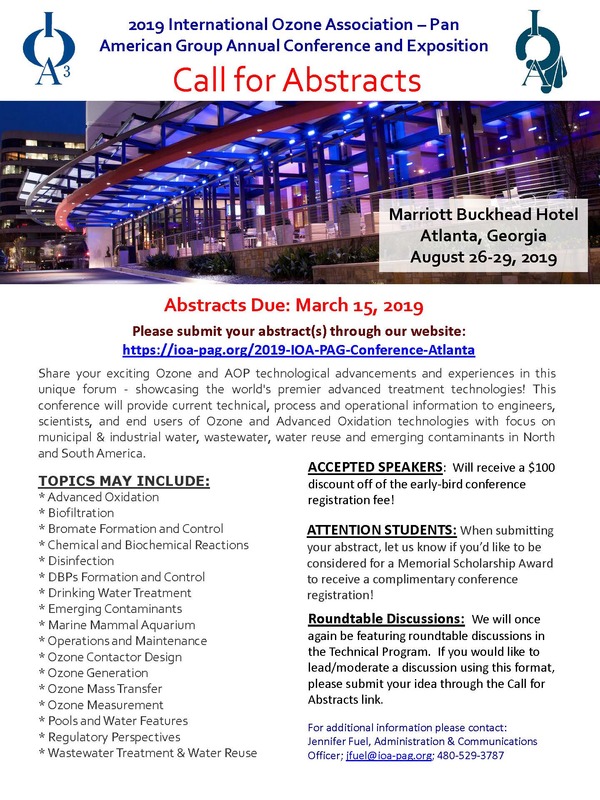 When submitting your abstract, let us know if you'd like to be considered for a Memorial Scholarship Award to receive a complimentary conference registration! This year, the Conference will have a session dedicated to roundtable discussions. Lead a discussion among conference delegates in a smaller group setting and encourage more questions than during a usual podium presentation. Each table will have a host/subject matter expert, and attendees will rotate among the tables every 25 minutes. If you would like to lead/moderate a discussion using this format, please submit your idea through the Call for Abstracts link.